The Star Nebula Cheer Trophy is always a great choice. This cheer trophy is economically priced to fit any budget. Cheerleading trophies come with a laser engraved brushed gold plate. FREE Shipping is available on orders of cheer trophies over $100. FREE Engraving. This is a great choice for an economy chearleading trophy. Choose a cheap chearleading trophy for your team or tournament trophy event. The Place Cheer Trophy is a great choice for tournaments and league champions. 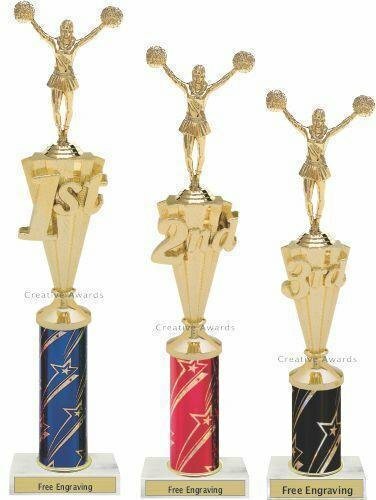 1st, 2nd and 3rd Place cheer trophies are available in several configurations. All of the cheerleading trophies are economically priced to meet your budget. The cheerleading trophy comes with a laser engraved brushed gold plate. FREE Shipping is available on orders of cheerleading trophies over $100. FREE Engraving. This is a great choice for an economy chearleading trophy. Choose a cheap chearleading trophy for your team or tournament trophy event. The Place Cheer Trophy is a great choice for tournaments and league champions. 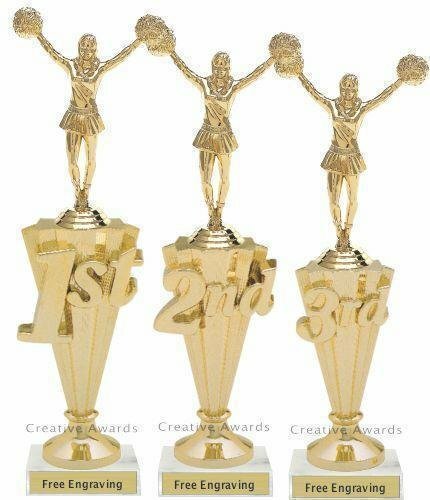 1st, 2nd and 3rd Place cheer trophies are available in several configurations. All of the cheerleading trophies are economically priced to meet your budget. The place cheerleading trophy comes with a laser engraved brushed gold plate. FREE Shipping is available on orders of cheerleading trophies over $100. FREE Engraving. This is a great choice for an economy chearleading trophy. Choose a cheap chearleading trophy for your team or tournament trophy event. 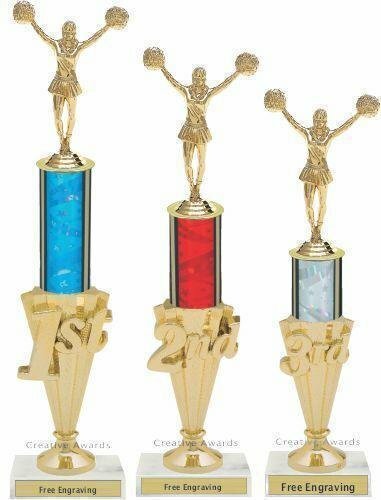 The Place Classic Cheer Trophy is a great choice for tournaments and league champions. 1st, 2nd and 3rd Place cheer trophies are available in several configurations. All of the cheerleading trophies are economically priced to meet your budget. The cheerleading trophy comes with a laser engraved brushed gold plate. FREE Shipping is available on orders of cheerleading trophies over $100. FREE Engraving. This is a great choice for an economy chearleading trophy. Choose a cheap chearleading trophy for your team or tournament trophy event. 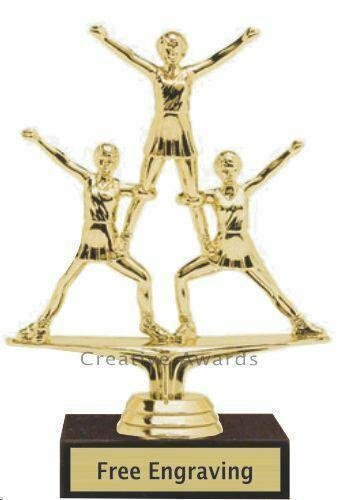 The Triple Action Cheerleading Trophy has three cheerleaders in formation on a black marble base is a great choice. The commemorative Cheerleading trophy comes with a laser engraved brushed gold plate. FREE Shipping is available on orders of cheer trophies over $100. FREE Engraving on all cheerleading trophies. This is a great choice for an economy chearleading trophy. Choose a cheap chearleading trophy for your team or tournament trophy event. 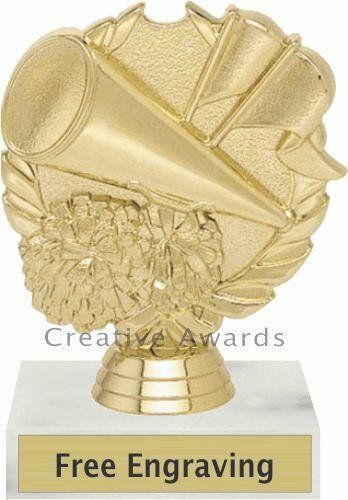 The Winged Cheerleading Trophy has a round column with flaming golden wings. This Cheer Trophy is a more elaborate choice that is still economically priced. Cheer trophies come with a laser engraved brushed gold plate. FREE Shipping is available on orders of cheerleading trophies over $100. FREE Engraving. This is a great choice for an economy chearleading trophy. Choose a cheap chearleading trophy for your team or tournament trophy event. The Winged Royal Cheerleading Trophy has a figure standing on a crown on top of a round column with flaming golden wings. This Cheerleading Trophy is an elaborate choice that is reasonalbly priced. Cheer trophies come with a laser engraved brushed gold plate. FREE Shipping is available on orders of cheerleading trophies over $100. FREE Engraving. This is a great choice for an economy chearleading trophy. Choose a cheap chearleading trophy for your team or tournament trophy event. The Wreath Cheerleading trophy is a great option. It is a small inexpensive Cheer trophy with great character. Cheer trophies come with a laser engraved brushed gold plate. FREE Shipping is available on orders of cheerleading trophies over $100. FREE Engraving. This is a great choice for an economy chearleading trophy. Choose a cheap chearleading trophy for your team or tournament trophy event. The Wreath Cheerleading Trophy is always a great patriotic choice.This cheer trophy is economically priced to fit any budget. Cheerleading trophies come with a laser engraved brushed gold plate. FREE Shipping is available on orders of cheer trophies over $100. FREE Engraving. This is a great choice for an economy chearleading trophy. Choose a cheap chearleading trophy for your team or tournament trophy event. Need an economy cheerleading championship trophy? Whether you call it a large trophy, tall trophy, big trophy, 2 column trophy or 2 post trophy, you are sure to find a wide selection of championship trophies here. These large trophies make great cheer trophies. The big trophies, also known as 2 post trophies or 2 column trophies, have a lot of character. For tall trophies, these cheerleading trophies are economically priced. The cheer trophy is available in several sizes. When you specify the height of the cheerleading trophy, the columns will be increased as needed. Free shipping is available on orders over $100. Free engraving is always included. This is a great choice for an economy chearleading trophy. Choose a cheap chearleading trophy for your team or tournament trophy event.